This immaculate 3BR/3BA home plus loft is 2600 square feet. The Master Bedroom has a king size bed, ceiling fan, huge walk in closet, and an armoire that hides a 26" Flat Panel with Dish Network. The master bathroom is large with dual sinks and a shower with multiple heads to hit those muscles after a long day of hiking. The second bedroom has a full size bed, large closet, ceiling fan and a dresser. The second bathroom has a single sink and a tub/shower combination. There is a linen closet in this bathroom as well. Third bedroom has been converted into an office for those who need to telework and a crib resides in this room for families with infants. The stairs to the loft are off of this room. The loft contains the third bathroom, two twin beds, a queen size bed, as well as a day bed with a trundle bed underneath. There is a large seating area with a couch and two chairs. There is a 37" flat panel television with Dish Network. The living room has two sleeper sofas and a comfortable rocking chair. There is also a 42" television with Dish Network. A saddle for kids to play upon as well as 4 barstools make up the rest of the living room area. The dining area has a large table that easily seats 6 people. The kitchen has updated stainless steel appliances. Refrigerator, stove, sink with disposal, dishwasher, and microwave. There is a laundry closet next to the kitchen with washer and dryer. There is a two car attached garage with a propane grill. Please use it on the driveway as there is a fire danger in the area so I do not want to put this on the decks. The front porch is large and the deck wraps all the way to the back of the house. The deck is huge with a large table, 6 chairs, one chaise, and a smaller table. There is also a kids size picnic table on the deck. Lots of entertaining and meals will be out on the deck. Located in the area is a private 25 acre lake which is stocked for excellent fishing and does not require a license as it is a private lake or a picnic is just minutes away. Small pets are accepted with a $100 fee per pet. There is a limit of two (2) small pets. ( A small pet to me is an animal less than 20 pounds). Please keep outside animals outside. Please no pets on any of the furniture. Please clean up after your pet around the house. My wife and I are extremely blessed to have this house in Bayfield. We currently live in Austin, TX and have been looking for property in the Durango/Pagosa Springs area for several years. My wife's family is from the area and I fell in love with it 30 years ago when I first visited. Our older children are grown and they truly love the property to bring their friends for a vacation away from it all. This home is so convenient to everything. Close to downtown Durango and the airport with major airlines, close to the Hot Springs of Pagosa Springs, Vallecito Reservoir is right up the road and several ski areas within an hour to two hour drive. Fly fishing, hunting and any and all outdoor activities are minutes away. This house is at the end of a road so you will not get much if any traffic. Neighbors are friendly and close enough in case of emergency. Sitting on the deck is the most amazing thing about the house. 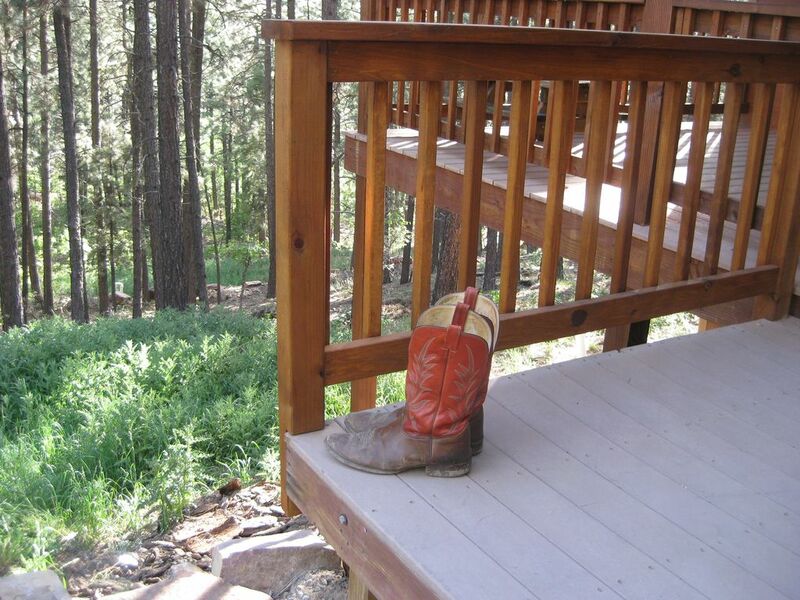 Watch turkey, mule deer, elk, fox, and other wildlife while sitting on the deck enjoying the day. Dual sinks in master bath. Walk in shower with multiple spray heads in master bath. Tub/Shower combo in second bathroom. Shower in third bathroom. Linens provided for all beds and sleeper sofas. Sattelite Wi-Fi in throughout the house. Wood stove in family room. Do not use if unfamiliar. Extremely hot surface will burn people, pets, anything else that comes in contact. We accept no responsibility for injuries caused by stove. Two Ethan Allen sleeper sofas. One Ethan Allen rocker with ottoman. (4) Bar stools, Saddle. 46" LCD television with Dish Network. Side by side stainless steel with ice maker. Electric smooth top stove and electric oven. Above stove stainless steel microwave. Some canned goods and other items. Feel free to use and replace. Please leave any extras when departing for the next people that come through. It is nice not to immediately run back to the store. Ethan Allen Table with 6 chairs. Also 3 barstools. (3) Dish Network and Satellite internet with wireless throughout the house. There is a stereo on the back porch but it is bring your own CD's. FM radio works great. There are some board games in the house. 1 acre of natural environment. There is no lawn or flowerbeds. Nice sized front deck with Church Pew for sitting. Large back and side deck with wrought iron furniture to seat 10+ people. There are some fishing rods and tackle in the garage. Please replenish anything you use. Enjoyed our stay . Lot of wildlife in the area . The house was set up pretty nice and you are at the end of the road. No clocks in the house. We enjoyed our stay. The house is beautiful! We stayed at this house for a month and it was very comfortable! We will be back. 1st time to have all 3 of our children together for a trip since '09. House was awesome and everything we expected except upstairs took a long time to cool down in the evenings with only 1 window which prohibited air flow, especially to the extra room in the back of area. Other than that, we loved the layout of the home. Plenty of dishes, pans, and all kitchen necessities. Wife and I had the master suite. Loved the bed and shower with 5 shower heads. Wrap around deck was a major plus to sit out on during the mornings and evenings sipping coffee. Located at the end of the street which was an added bonus with little to no traffic. We found Lake Nighthorse in Durango which remains full and recently opened to public. Our kayaks we bought for the trip were put to good use there as part of the lake is partitioned off from motor boats. Great fishing and clear water made for an enjoyable day trip. Drought affected some of our plans as Lake Vallectio was extremely low, the rivers too low to enjoy tubing and rafting, and the neighborhood lake not near as big as described due to drought I'm sure. Fires in the area prohibited enjoying the full ride of the Durango and Silverton Train we looked forward to but they were running the diesel version for short trip through scenic areas. Wife and I had fun on the ride and found some great background areas for pics. Hiked a few miles in the San Juan Forest and found an area to enjoy wading around in the water. Overall, an exceptional experience that made both of us (and our sons) ready to make the move to the mountains in a couple of years. Would recommend this home to anyone traveling to the area and would stay again. Can't thank Staley and Monica enough for sharing their beautiful mountain home with us! We had a wonderful time. Everything we needed, plus! Highly recommend!!! Deer, "neighbors" and other wildlife so peaceful to watch. Our family will always treasure the fond memories of our gathering together at this quiet, lovely mountain home! Nicely, accommodated: 6 usually of us, up to 12 at one point. Hope to stay again someday! Durango is 18 miles away. Vallecito Reservoir is 5 miles away. Navajo Reservoir is 30 miles away. Pirgatory is 45 miles away. Pagosa Springs is 45 miles away. Wolf Creek Ski Area is 75 miles away. Telluride Ski Resort is 88 Miles away. Private STOCKED lake in development, no license required.